An inhibited propylene glycol such as “DowFrost” is best. DowFrost contains special corrosion inhibitors for low system maintenance and better heat transfer compared to other glycols. It also has a longer fluid life, up to 20 years in some cases. Even through uninhibited glycols do lower the freeze point, they are often more corrosive than water. The corrosion rate of ethylene glycol on iron, for example, is more than 2.5 times faster than plain water. On steel, it is 4.5 times faster. Automotive based antifreeze Should never be used! Automotive antifreeze contains silicate based inhibitors, which are compatible with automotive components. In an industrial application, the silicates will coat the heat transfer surfaces and reduce the cooling efficiency of the system. Silicates can also significantly reduce the life of pump seals. For a complete literature package, material, safety data sheets and purchasing information, contact the following: Dow Chemical 1-800-447-4369 (Canada 1-800-363-6250) Dowfrost inhibited propylene glycol. 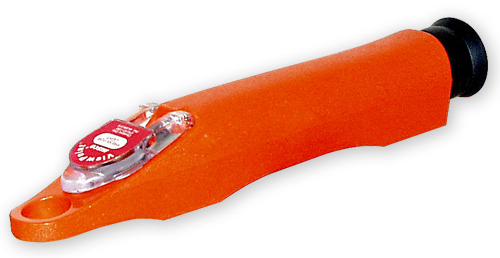 A refractometer should be used on a regular basis to determine the mixture strength according to freeze point. 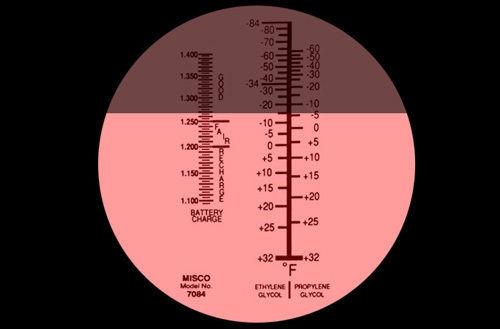 The coolant freeze point is indicated on the line between the dark and light areas on the scale. In this example, the freeze point is about -5°F to -6°F. The freeze point temperature should be 25°F below the lowest required setpoint (see chart). Water evaporates from the mixture, and if you continue to add a premixed solution, eventually you will have too much glycol. It is necessary to add water or glycol to maintain proper freeze point temperature. The refractometer pictured is accurate and easy to use for maintaining and checking for proper glycol levels. Note: Glycol freeze point must be 25°F below lowest setpoint. Would you like to Download FYI #114 to your browser?